Relics were used in early Buddhism to represent embodiments of a transcendent or imminent or otherwise absent Buddha. From Kandy to Kathmandu to Kyoto, there was hardly a Buddhist site that did not enshrine some physical remains of the Buddha (body relics); some object that once belonged to him, some trace of his presence enlivened by association with his body (contact relics); or his teaching (dharma relics). The Bimaran casket, dated between 30BCE to 60CE, with Buddha, center, and Brahma, left, Sakra, right. British Museum. 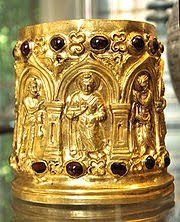 Among the more famous relic finds in India are those made at Piprahwa, a site that some have identified with the Buddha's hometown of Kapilavastu; at Vaisali, where relics were unearthed from what was possibly one of the original eight stupas built over the Buddha's remains (according to believers); and near Peshawar, where a magnificently embossed gold reliquary (Bimaran casket) was found in which there were three small fragments of bone that are believed to be the original relics deposited in the stupa by King Kanishka which Xuanzang tells us were relics of Buddha. However, it is doubtful whether any of these body relics are authentic. For example, a Buddha tooth found by William Peppé during excavations at a site near his estate in 1898, which is purported to be Kapilavastu, Buddha's hometown, turned out to be a pig's molar. From 'The Piprahwa Deceptions: Setups and Showdowns,' T. A. Phelps:. "Peppé himself retained a tooth from the alleged Piprahwa finds. This tooth was taken by the author, Charles Allen, to the Natural History Museum in London, where palaeontologists declared it to be the molar tooth of a pig... In his latest book, The Buddha and Dr Führer, Allen (who supports the authenticity of the Peppé claims), attempts to explain away the distinctly awkward presence of this tooth by claiming that it came from a broken casket found by Peppé near the summit of the stupa ... Moreover, we have already noted Bloch's observation that the bone relics from Piprahwa did not appear to be of human origin. Since portions of these items are now enshrined at the Wat Saket Temple (Thailand), the Shwedagon Pagoda (Rangoon), Anu-radha-pura (Ceylon), and in the Nittaiji Temple in Japan, this raises the appalling specter that for over a century the Buddhist world may have been venerating the remains of some ancient pig." Usually greed and gullibility are at the root of these hoaxes; From 'Lumbini On Trial: The Untold Story,'. T. A. Phelps:. "Führer was later found to have fraudulently laid claim to the discovery of about twenty relic-caskets at sites close to Lumbini, which allegedly bore Asokan, and even pre-Asokan inscriptions. One of these caskets supposedly contained a tooth-relic of Buddha ..., which Führer illicitly exchanged for various expensive gifts with a Burmese monk, U Ma, (the correspondence between these two makes for lamentable reading, with Führer exploiting U Ma's gullibility pretty unmercifully). Following an official enquiry into the matter, this tooth-relic was found to be 'apparently that of a horse.' Führer had explained its size to an indignant U Ma by pointing out that according to 'your sacred writings' the Buddha was nearly thirty feet in height!". I have a suspicion that the famous Buddha tooth relic at Kandy, Sri Lanka, may be of a similar sort. Here's why:. From Relics of the Buddha. by John S. Strong:. "In 1561, an interesting ceremony took place in the Portuguese enclave of Gõa, in Southwestern India. During a military operation in Sri Lanka, Portuguese troops had captured what 'local idolaters,' (ie Buddhists) claimed was the tooth of the Buddha... , and had delivered it as a prize to their viceroy, Don Constantino da Bragança. The viceroy had hoped to hold it for ransom, but now the archbishop of Gõa, Don Gaspar, was insisting that it be destroyed. On a porch overlooking the river... , in the presence of a great crowd of Christians and 'pagans,' he called for the tooth and 'placed it in a mortar, and with his own hand reduced it to powder, and cast the pieces into a brazier which stood ready for the purpose; after which the ashes and the charcoal together were cast into the river, in sight of all those who were crowding the verandahs and windows which looked upon the water." This story was known in 17th century Europe. See here... So what is the tooth relic they're worshipping in Kandy, Sri Lanka today? Also from Relics of the Buddha by John S. Strong:. "Sometime in the middle of the fifth century, the Chinese pilgrim Daorong set out for India on foot. When he and his companions arrived in what is now Afghanistan, they proceeded to visit various sites of pilgrimage, places that were, in one way or another, associated with the historical Buddha Sakyamuni. In Nagarahara [Jalalabad], they found 'a piece of bone from the top of the Buddha's skull ..., four inches long and beige in color'. A bit further on, they visited a monastery, where the Buddha's staff was enshrined, and, in the city itself, they stopped at another sanctuary, where some teeth and hair of the Buddha were kept in a jeweled reliquary. Outside of the town, they went to a famous cave, where they saw the 'shadow' of the Buddha, an image he was said to have projected on a wall of the grotto. [This is one of three likenesses of the Buddha which he was said to have granted in his lifetime, thus striking another nail in the aniconism theory]... Near the cave, they venerated a set of Buddha footprints imprinted on a rock, and, a bit further away, a spot where Buddha had washed his robe. Beyond that was a large stupa, said to have been built by the Tathagata himself, which was gradually sinking into the ground: its final disappearance would mark the end of the Buddha's teaching. By the side of the stupa was an inscription in Sanskrit reportedly written in the Buddha's own hand." This seems to imply that the people of ancient Gandhara thought Buddha lived in, or at least visited, their country!